Houston’s Third Ward was once a thriving community. Retail outlets, restaurants and night spots were once prevalent in this historic neighborhood. Now, vacant lots or empty buildings have replaced these businesses. This semester, University of Houston students from the School of Art’s Graphic Design Program teamed up with peers in the Gerald D. Hines College of Architecture and Design to offer a glimpse into the Third Ward’s past. The project, “Animating History,” paired students who designed 22 life size map pins (like the ones used to point out locations on online maps) that illustrate once successful establishments along the Dowling Street corridor. Guiding students were graphic design associate professor Fiona McGettigan and architecture professors Susan Rogers and Ronnie Self. Students physically placed these pins (standing at about 6 feet tall) at spaces that are now the sites of desolate lots and shuttered buildings. A selection of the pins remain in the Third Ward – including one at the Ennis Washateria (3112 Ennis St). Others are on view in UH’s Blaffer Art Museum through May 14 as part of the School of Art Student Exhibition. Sanchez worked with fellow graphic designer Andrea Rivas and architecture student Austin Rees on a pin focused on the Two Sisters nightclub that hosted live music at 3717 Dowling St. Now, the site is a lot with dead grass and debris. 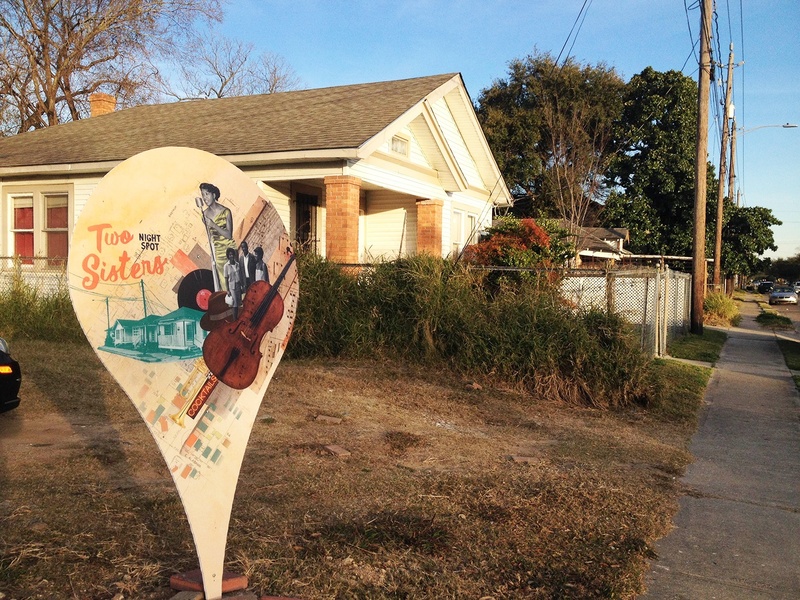 Rees researched the site and its history and Sanchez and Rivas designed the pin using images of blues and jazz musicians and typography that reflect the hand painted signs that linger in the neighborhood. Other pins focused on defunct Third Ward establishments such as the Elgin Drug Store, Park Theatre and the S&S Domino Parlor. Because map pins have a teardrop shape, they presented a challenge to the student designers tasked with animating a piece of history on this unusual format. Another component to “Animating History” is a book titled “Coming Soon: Retrospect and Revival of Houston’s Third Ward.” Each graphic design student designed a separate version of this text, which contains essays on the Third Ward and images of the 22 map pins. Students also bound their respective books by hand. The project not only tapped students’ creative talents, it allowed them to immerse themselves in the community. In doing so, their designs offered a look into a neighborhood’s past and instilled hope in its future. “Animating History” complements another project focused on the Dowling corridor. This semester, Rogers and Self’s students developed architecture plans for residential and business spaces and presented them to the Emancipation Economic Development Council (EEDC). McGettigan’s students also contributed potential logos to represent the EEDC as it moves to influence the development of this historic Houston neighborhood.